polynesian spareribs | omfg. so good. … when really you’re at home. And it’s February. We don’t take many vacations. Remember, we have two small kids? So, we’ve gone to great lengths to create a paradise vibe right at home. 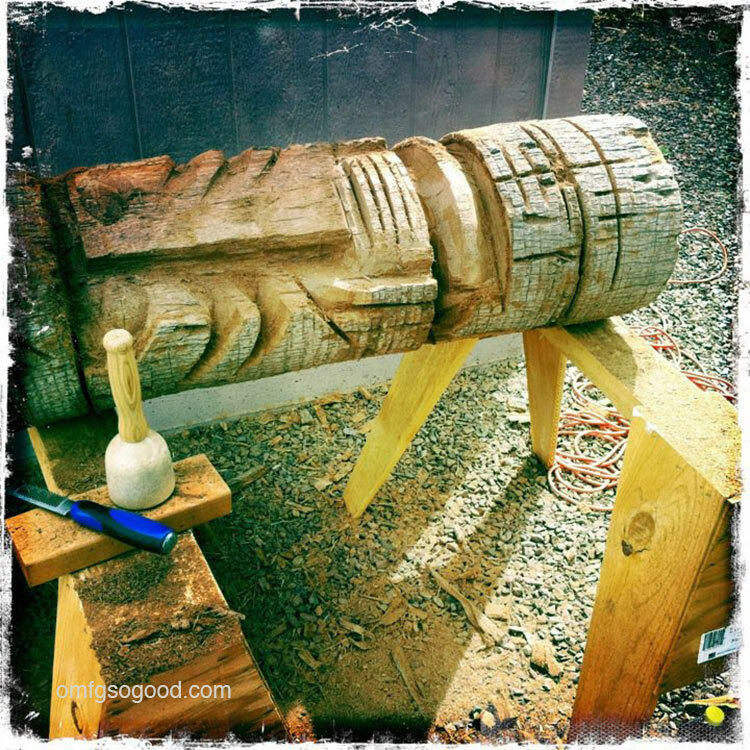 Complete with hand carved tikis made from reclaimed downed palm trees. Every once in a while, when we’re really in need of a giant bottle of Calgon to take us away, we bust out some Mai-Tais and Polynesian fare and hang out with our tiki pals by the fire pit. It used to be so easy to escape to the islands by calling in an order to the local Trader Vic’s and sending Jonny for a pick-up. Then the local Trader Vic’s closed. So I had to do some digging (honestly, around five whole minutes amazon.com) to find a copy of Trader Vic’s Tiki Party, which has been my go-to recipe reference for all things ‘vacation-at-home-island-style’ consumable. 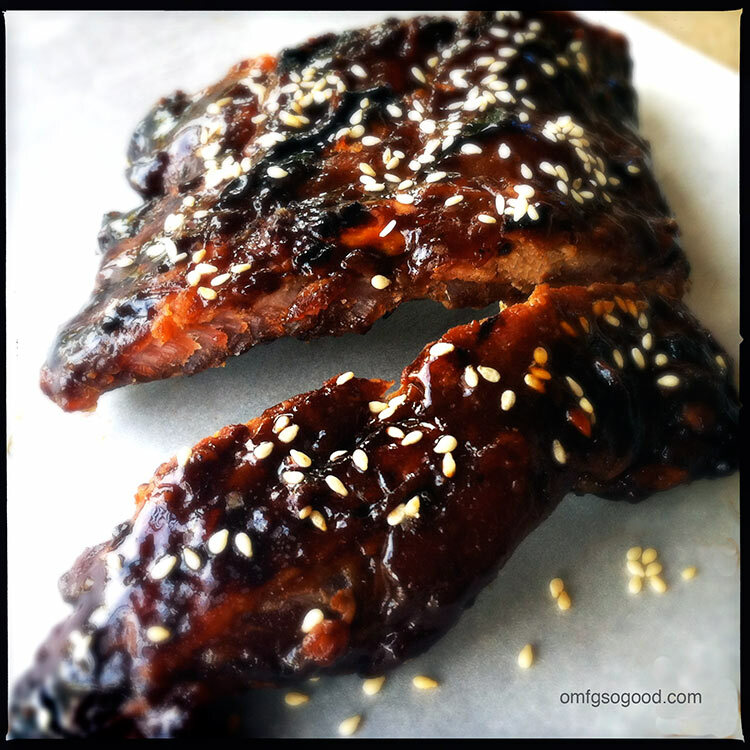 Like these amazingly tasty, sugar cured then glazed, pork spareribs. To make the BBQ glaze, combine the hoisin, soy sauce, chile sauce, garlic, ginger, sugar and sesame oil in a bowl and whisk to combine. Cover and refrigerate until ready to use. BOOM. EASY. Preheat the oven to 300 degrees, remove the ribs from the sugar mixture and pat dry with paper towels. Arrange the racks on an aluminum foil-lined sheet pan and brush both sides with around 1 cup of the BBQ glaze. Cover loosely with plastic wrap and let stand at room temp for 20 minutes. Bake the ribs (uncovered) until they are very tender, around 1 1/2 to 2 hours, basting with the juices every 30 minutes. If the pan gets too dry and the juices begin to burn, add up to 1 cup of water and scrape/stir to dilute the caramelized sauce. 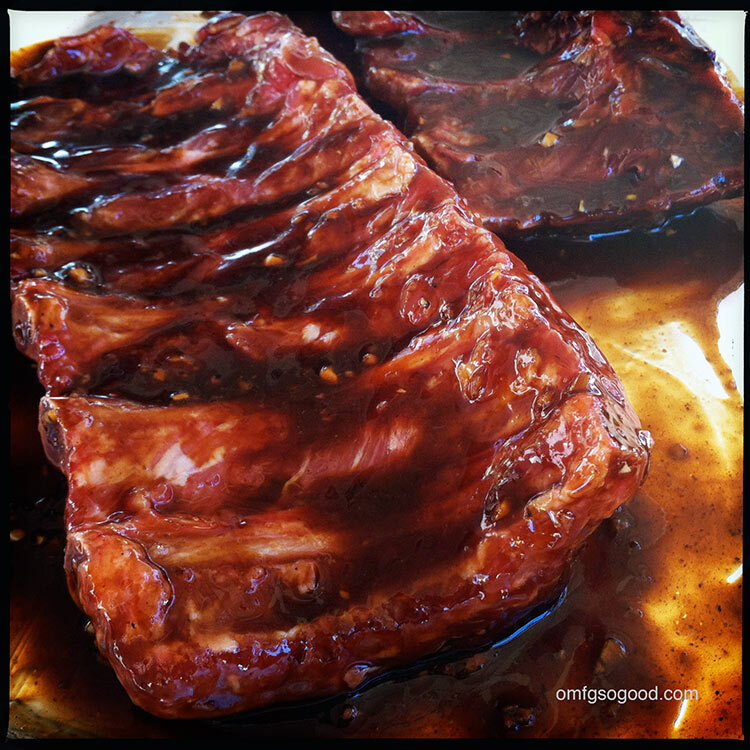 Remove the ribs from the oven and let them sit, covered with foil, until ready to grill. Preheat your grill to medium-hot. 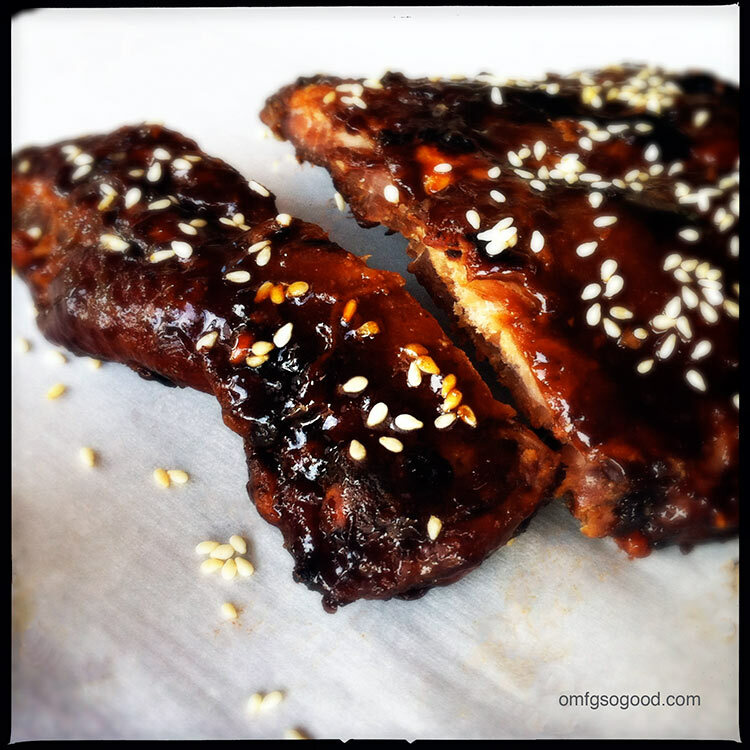 Grill the ribs, turning and brushing with the remaining BBQ glaze, until dark golden brown. Check them often as the sugar in the sauce could burn quickly. Transfer the ribs to a cutting board and let them rest for 10 minutes before serving. Garnish with toasted sesame seeds. What an amazing recipe! Everything I could ever want in a rib! 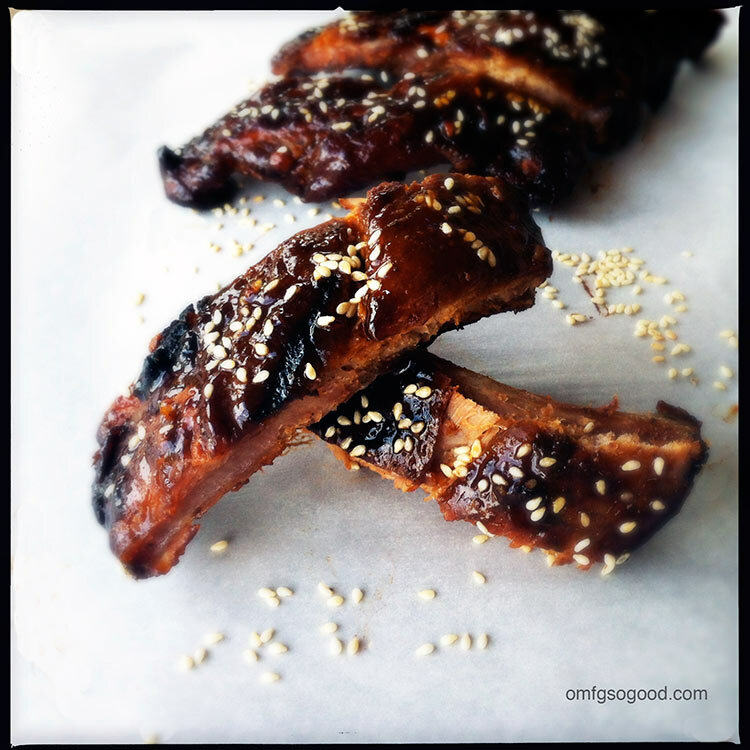 Pingback: dry rub pork ribs | omfg. so good.